California’s high-speed rail system will reach speeds of 220 miles per hour and make the trip between San Francisco and LA in less than three hours. Even by 2029, it’s unlikely we’ll all be ferrying ourselves to and fro via flying cars and hoverboards, but if all goes according to plan, the state of California will still have an exciting, new, more-grounded form of travel: high-speed rail. The system, which is being developed by the California High-Speed Rail Authority, will run from San Francisco to the Los Angeles Basin. It will be the first of its kind in the nation, and at speeds of up to 220 miles per hour, it will transport passengers between the two cities (both of them currently rated among the world’s worst traffic regions) in less than three hours. 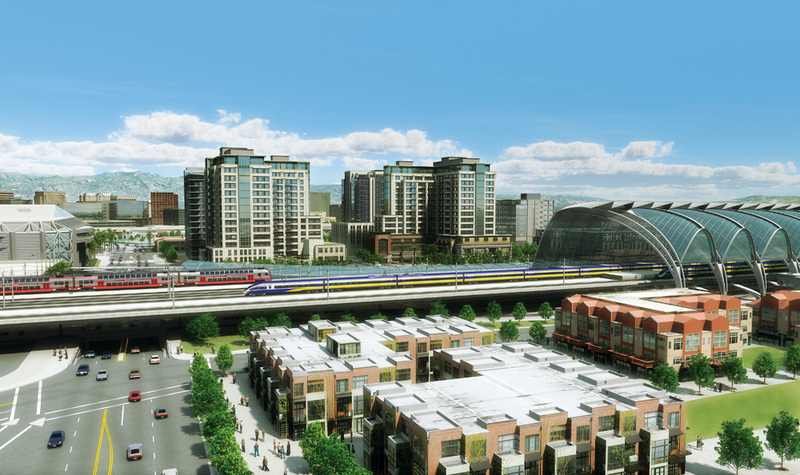 Eventually, the system will run to Sacramento and San Diego as well, with as many as 24 stations and 800 miles of track—which, according to the authority’s estimates, will help revitalize the state’s downtown cores and create more than 100,000 jobs. The railway will also reduce emissions equivalent to those produced by a 500-mile-long line of cars packed onto a California freeway. And, it will save the state as many as 171 flights daily by 2030; by 2040, it will have reduced the state’s total vehicle miles of travel by almost 10 million a day. It’s an ambitious vision, but again, this is all assuming that everything goes according to plan. So, the authority is currently doing all it can to ensure its hypothetical becomes a reality through proper organization, preparation, and collaboration. “This is a once-in-a-lifetime opportunity to do something that is a once-in-a-generation investment,” says Jeff Morales, CEO of the authority. “It’s something that needs to happen, and it’s our job to make it happen.” Reaching all the way back to the early 1980s, the need to create a better transportation system for the Golden State has been in various stages of development for so long that the idea is now middle-aged, but it only received tangible traction in 1996, the year the authority was formed. The organization was chiefly brought together to handle the planning for a ballot measure regarding the system, scheduled for a vote in the 2004 general election. The proposal for the measure was met with two setbacks, though, which delayed the vote—first to 2006, then 2008. That year, voters finally approved the issuance of bonds, and four years later, in September 2012, the Obama administration gave its own endorsement, fast-tracking the project. Notably, the president’s approval—aptly named the “We Can’t Wait” initiative—streamlined the permitting process for the segment of track from Fresno to Bakersfield. But, as it is with any massive state project, winning public approval for the rail line is a continual challenge. (Morales is quick to point out that the Golden Gate Bridge—a San Francisco icon—had more than 2,000 lawsuits filed against it during its construction in the Depression.) So, the authority is making a concerted effort to interact with the state’s populous through outreach programs for those directly affected by the project and through the disbursement of information. And, though the lawsuits against the rail line have been settled, allowing momentum to gather, the authority will have to maintain a fast pace to keep energy for the long-term project alive. As the CEO, Morales has had a major hand in bringing together a team he hopes is different from that of a typical state organization, and he has concentrated on keeping it lean so that it’s more akin to a public-private partnership. It has approximately 125 employees and growing, and it comprises top people from a range of public and private industries. Together with a private project-management team and the Federal Railroad Administration, the state-run authority is working toward a blended system that will include new tracks as well as upgrades and connections to existing regional and local rail infrastructures. Its $68 billion, five-step 2012 business plan arose from the passing of Senate Bill 1029 in July 2012, and the authority updated the outline in 2014 to adapt to the setbacks inherent in a project affecting tens of millions of citizens. The rail line is expected to revitalize downtown corridors, and it will likely create more than 100,000 new jobs as each of its five phases goes up. Eventually, it will extend to Sacramento and San Diego as well. The first phase, costing an estimated $5.85 billion, will offer immediate statewide benefits. Construction will begin in the Central Valley, an area infamous for its high unemployment rate, and it will generate more than 20,000 jobs annually over the course of five years as crews work on 114 miles of track. Funding for the initial build will come from a combination of federal and state sources, but future segments will be backed by a combination of state-bond funds and a program designed to bring in private investment. The first section of track will run from Madera County to Bakersfield, and after it’s completed in 2019, additional work will be done to electrify the Bay Area’s Caltrain Corridor and help improve Bay Area rail infrastructure. The measures will provide passenger-rail transportation from the Central Valley to Southern California for the first time. By 2022, a 300-mile section from Merced to the San Fernando Valley will run without an operating subsidy, hopefully attracting private investment for the system’s expansion. In 2027, the line will expand from San Jose to Gilroy, and it will then be connected to the Merced portion. (The route will halve the time it takes one to traverse the same distance by car.) By 2029, all the segments will be connected, allowing high-speed travel for more than 520 miles from San Francisco to Los Angeles. The final phase will extend the rail to Sacramento and San Diego, adding 280 miles of track. As Morales sees it, this is an aggressive yet realistic schedule with a lot of work that will need to be done simultaneously. To hit each goal, his organization is constantly evaluating new methods that will help streamline the process and shorten the time frame, but the fact remains that the project will be a long undertaking. Much of the railway’s design, its general route, and its connection points were decided upon simply to meet the guidelines of the US Department of Transportation, but in finalizing the construction plans, Morales and his team looked at everything from environmental impact to community impact. The project will draw from the latest technology and best practices, and the authority has even established consulting relationships with numerous countries that already have high-speed rail systems. One such relationship is a memorandum of understanding between the authority and the Japanese Ministry of Land, Infrastructure, Transport, and Tourism, which can be traced all the way back to California’s early rumblings for high-speed rail in 1981. The state will take the knowledge that Japan has gained from its renowned Shinkansen—the long-running bullet-train system—and adapt it to a new geographic and economic climate. Hopefully, by being at the forefront of high-speed rail in the United States, Morales and the authority will act as exemplars for other states looking to adopt similar programs. They could become industry leaders for high-speed rail in the process, ushering in still more economic opportunities for the Golden State. “It’s about preparing California for the future,” Morales says. Such lofty ambition is what drives the organization’s board members to dedicate large portions of their time to the program. The board is a who’s who of finance, public-transit, infrastructure-development, and environmental-law professionals appointed by the governor and state legislature—but they are all still technically volunteers. California’s population of 38 million is projected to climb to 50 million by 2050, so the state’s zeal for high-speed rail has been born out of necessity more than anything else. And, with millennials gravitating toward walkable, urban neighborhoods, it only makes sense to cater to their needs. Increasingly, people—Californians or otherwise—are fantasizing about ditching their cars to ride the rails, but currently the infrastructure does not allow it. The authority hopes to realize their dream (at least on a local level) and show that if you build it, they will ride. In total, the system could have as many as 24 stations and 800 miles of track, and it will save the state roughly 171 flights daily by 2030 and reduce its total vehicle miles of travel by almost 10 million a day by 2040.